Any worries that UNLV might have a bad carryover after Saturday night’s heart-breaking 91-90 overtime loss at Boise State were erased with an impressive 78-70 victory over Colorado State on Wednesday night at the Thomas & Mack Center. 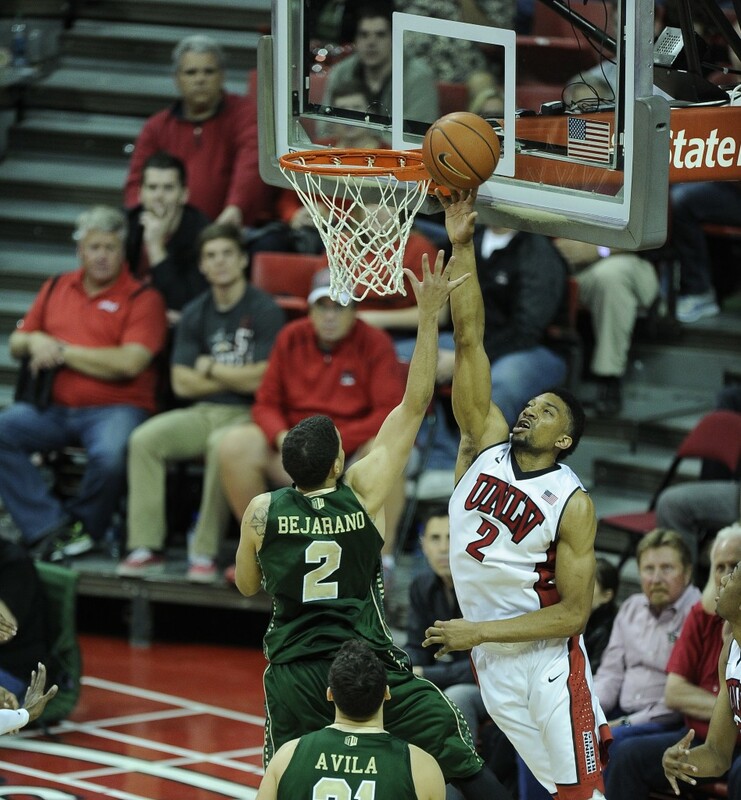 Guard Bryce Dejean-Jones scored 19 points and grabbed nine rebounds, Kevin Olekaibe finished with 15 points and Deville Smith (12) and Jelan Kendrick (11) also scored in double figures as the Runnin’ Rebels (18-9, 9-6) built a 14-point first half lead and then withstood a late Colorado State comeback to move into sole possession of third place in the Mountain West Conference. “We’re a group that went though a tough week last week but we weren’t going to be denied tonight,” UNLV coach Dave Rice said. The victory snapped a two-game losing streak that started with a frustrating 68-56 home loss to conference co-leader New Mexico and ended with a controversial overtime loss at Boise State after Deville Smith’s apparent game-winning 3-pointer at the buzzer was wiped out following a lengthy replay review. It also avenged a lethargic 75-57 defeat to the Rams (15-14, 6-10) in Fort Collins on Feb. 5, arguably the Rebels worst performance of the season. Center Khem Birch finished with eight points and nine rebounds, forward Roscoe Smith grabbed 11 rebounds and freshman forward Chris Wood added six points and eight rebounds in 23 minutes off the bench to pace the Rebels. J.J. Avila scored a game-high 22 points, Daniel Bejarano finished with 21 points and Jon Octeus added 17 points for Colorado State, which closed to within 62-61 with 8½ minutes remaining before the Rebels went on a 9-0 run highlighted by an Olekaibe 3-pointer to seal the win. UNLV returns to action on Saturday afternoon at Air Force.